This has been one of the best years for the Oscars. We take a look at three Oscar-nominated movies that have been released on DVD. This will be known as the movie that fetched Daniel Day-Lewis his Best Actor statuette, but he is the dark vortex of a terrifyingly bleak movie. The story is set in the turn of the century America, as oil prospecting is booming and creating as many unscrupulous millionaires as you could care to count. 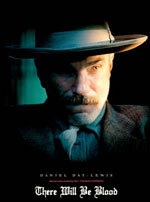 Daniel Plainview is the worst of the lot. Paul Thomas Anderson’s brooding epic is in many ways like Orson Wells’s Citizen Kane, the only difference being that Plainview has no moral centre. The film traces his career from a mining labourer to an oil magnate and proceeds to harrowingly reveal the madness in the depths of his soul. Tim Burton is one of the few living directors who have a distinct signature style. You’d never mistake his dark Gothic films for anyone else’s. Backed by old cohorts Johnny Depp and Helena Bonham Carter, Burton delivers the bloodiest musical in film history. Adapted from the stage musical, Sweeney Todd tells the gruesome tale of a barber whose life is ruined by an evil judge. He returns after many years in prison in Australia, hell bent on revenge. And in his rage, it’s not just the judge he wants to kill, but anyone who will come to his shop for a shave. Bonham Carter plays the landlady who turns the bodies of Todd’s victims into finger-licking good meat pies. Before Michael Clayton, writer-director Tony Gilroy was best known for the screenplay of the Bourne trilogy of movies. In his directorial debut, he shows that he has learnt the art of writing and filming a gripping thriller very well. Michael Clayton is very different from other thrillers, though. In this story of a “fixer” in a powerful law firm, George Clooney brings energy and verve to the title character who specialises in taking care of the dirty work that goes on in the corporate world. Tom Wilkinson almost upstages Clooney as a bipolar lawyer who’s out to undo wrongs. An equally powerful presence is that of Tilda Swinton, who plays a successful yet troubled executive.